Yet the evidence for this is thin. Despite intense scrutiny of the MP’s record from the press no other incidents have been identified (a contrast with loyalist politicians who have years of vile abuse to their name). McElduff appears an idiot, but this arises from a system where the only requirement for public representatives is loyalty to your party. The IRA has been disbanded, loyalist paramilitaries, whom the police indicate are still active, are in open alliance with the Democratic Unionist Party. Where does the synthetic outrage from unionist politicians come from? 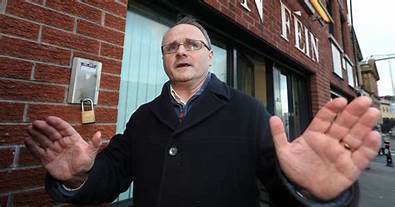 What appears as moral outrage is a political attack on Sinn Fein, often led by full-time sectarian provocateurs such as Gregory Campbell of the DUP, with clear political objectives. The claim is that Sinn Fein commemorates sectarian atrocity and this negates the “equality agenda” around which they base their refusal to reboot the Stormont executive. (This is a standard unionist strategy, unable to deny that they are sectarians, they level the ground by claiming that everyone is). What appeared to be outrage at sectarianism is now a traditional sectarian spat. A by-election for the now vacant Tyrone Westminster seat is faced with the prospect of two opposing “victim” unity candidates. Irish nationalism has joined in, exasperated at Sinn Fein’s failure to fall on their sword and restore the local administration in the North and also by the electoral challenge by the former republicans in the Southern state. A conference addressed by DUP leader Arlene Foster, with an anodyne speech that could have been written in the ’50s, was met with adulation. The fact that there were no concessions to northern nationalists seemed to escape the notice of the southern establishment, as did the fact that Foster is a cheerleader for Brexit in the face of a majority vote against it in the North. The truth is that Sinn Fein’s basic position is irrefutable – yet all, Nationalist, Unionist, British, trade unions, civic society, even Sinn Fein itself for most of its time in the Stormont executive, refute it. Calling on the authority of the IRA and basking in a “freedom fighter” hagiography was an important element in lulling supporters. The reality of Kingsmills was never confronted. Now McElduff’s antics have ended that phase. Was there an alternative? The alternative would have involved openly organising defence committees, exposing state involvement, trying to extract a price – closing down nationalist involvement with the state, threatening the Dublin government, appealing to working class forces in Britain and internationally. In disarray in the North, scrabbling to join a capitalist government in the South, Sinn Fein’s future is firmly with the Irish bourgeoisie.